or in those stolen moments when you’ve crept outside at dusk for a few precious minutes of solitude. In my household, peas rarely make it as far as the kitchen, and since other family members inevitably track down the pods too it’s wise to plan a succession of pods by sowing right across the season. And that’s part of the beauty of peas; their diversity both in harvest times and type of crop. By using staggered sowings and a mix of first early, second early and maincrop cultivars you can pick peas from May right through to early autumn, whether they’re peas to pod, flat-podded mangetout or crunchy sugar snaps. Add to this their various growth habits, from teeny 45cm (18in) plants compact enough for a window box to 3m (10ft) climbers, and you’ve got a pea for any garden situation. Peas prefer a sunny site and moisture-retentive but well-drained soil that was improved with organic matter the previous autumn. They don’t like extreme heat or drought, which means spring sowings are best, although a wet British summer suits them very nicely (something to console yourself with if it’s cool and wet this July). 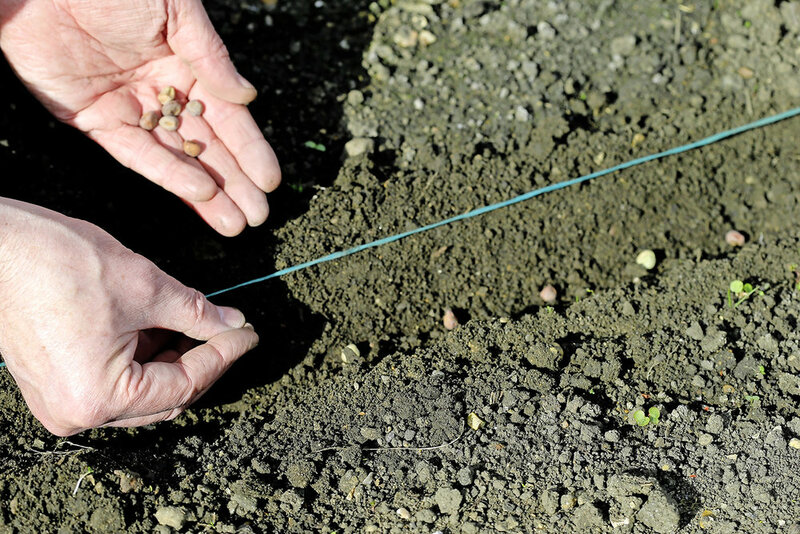 Drainage is especially important with very early sowings since they despise cold, wet soil. Autumn sowings (to overwinter) only succeed on well-drained, sheltered sites or, better still, under cover. Smooth-seeded cultivars are hardier and better for this job than wrinkle-seeded. Apart from ensuring plants have adequate support it’s important to keep picking and watering to keep the harvest coming. If you let any pods become mature and mealy, you’re telling your plants their work is done and the crop will be over. Unless there’s been plenty of rain it’s worth watering heavily once a week when plants are in flower to ensure the maximum crop. 1. START THEM OFF Sow outside direct in a well-prepared seedbed April to June, once the soil has warmed. Draw out a flat- bottomed drill 15cm (6in) wide and 5cm (2in) deep, allowing at least 60cm (2ft) between drills (more for tall cultivars). Or sow indoors in pots in February. 2. SCATTER THE SEED Space seeds 5cm (2in) apart along the base of the drill. Cover with soil and tamp down gently with the back of a rake. Cover with a layer of fleece to protect emerging seedlings from birds. 3. ADD PLANT SUPPORTS Once seedlings are through and growing strongly, remove fleece and erect twiggy hazel supports or pea netting (choose biodegradable jute rather than plastic). They climb well but will appreciate a supporting corset of twine loops. Q What are these little maggots inside my pea pods? A Pea moth is a pain and no one wants to see little white caterpillars where their peas should be. Adult moths pupate in the soil and emerge in June and July to lay their eggs on flowering pea plants. If you sow early or late, so your plants aren’t flowering during this time slot, you can avoid the moths and enjoy unsullied pods. Alternatively, grow a dwarf crop and cover the whole lot with insect-proof netting. Or, choose a mangetout cultivar instead. Q Why are plants looking white and dusty? A Powdery mildew is a fungal disease that can affect peas. It’s mainly a risk late in the season if they’ve become stressed through a lack of water. Make sure they’re growing in a moist but well-drained soil, preferably one improved with well-rotted organic matter the previous autumn. Mulch to retain soil moisture and water deeply during dry spells. If individual plants show signs of disease, cut them out and clear away all infected foliage straight away. Look out for cultivars known for resistance to the problem, such as ‘Ambassador’. Q What’s eating my seedlings? A Slugs and snails can damage newly emerged seedlings, but if shoots appear snipped and broken then pigeons are to blame. Covering young seedlings with fleece works as a barrier. However, once pea sticks are in place it requires a little more engineering to loop the fleece around. It’s usually worth making the extra effort until plants are growing away strongly. Q Why didn’t my peas germinate? A This is usually caused by sowing too early into cold wet soil. Or, they may have been eaten by mice, which have an alarming ability to sniff out new sowings. Try germinating in Rootrainers, loo roll inserts or lengths of guttering, in a mouse-free greenhouse or indoors.